As soon as I saw the recipe for the May Bread Baking Babes, brought to us by our Kitchen of the Month, Cathy of Bread Experience blog, I knew that Sweetie would love this bread. 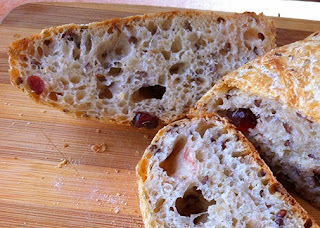 Although I usually change lots of things to suit myself when I bake from a recipe, even a new one, for this one I stayed really close to what was given, changing only one of the flours from rye to a 9-grain blend and changing the prunes to dried cranberries because he loves a bread he gets in Berkeley that has dried cranberries in it. I did use parchment as the base for baking them on preheated pizza stones, but otherwise stay close to directions, including a pan of ice cubes for steam on the top rack. I measured the ingredients on my scale since amounts were given in grams. 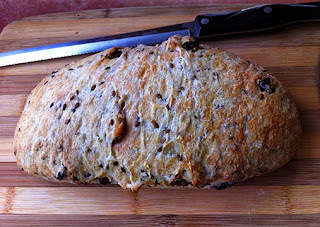 I let the flax seeds soak (longer than required but that didn't seem to harm anything), had the poolish sit out even longer than required for even more flavor and I chilled the dough while I went to the gym and brought it back to room temperature before doing the next fold because I did have to leave it for a while and didn't want the dough to stay warm too long without the folding. All of this, plus the ice cubes in a pan to give steam during the first part of the baking, worked really well. I made three loaves and they looked fine and tasted even better. Would have been even better with the rye flour (which I discovered I was out of) but I really liked the dried cranberries. Sweetie ate half of the first loaf he liked it so much. Thanks Cathy for an excellent recipe and one I might not have tried on my own. That is one of the joys of belonging to this bread baking group...we get to try new breads and techniques and are encouraged by our fellow Babes to stretch our skills...and to have fun. Cathy has a really wonderful set of photos and tips, along with the original recipe on her blog, to help you make the best ciabatta ever! Do visit the other Babes and see what they did this month with this bread. Also, if you want to be a Buddy, bake the bread, take a photo and send Cathy and e-mail with the photo, a URL to your blog post and a short description of your experience baking the bread. Her email address is breadexperience (at) gmail (dot) com. You have until the May 29th and she'll post a round up soon after that. Come bake with us! Mix all ingredients until well incorporated, cover and set aside. Let it sit for at least one hour. Mix all ingredients until well incorporated with D.D.T. of 70°F. Mix together all the ingredients except the flax seeds, and plums. Once everything is thoroughly incorporated, mix in flax soaker and dried cranberries. Transfer the dough into an oiled container. Divide: Dough is not scaled. It is divided by measurement. Place loaves on a floured couche, or do as I did and put the dough from the bucket on a heavily floured board, use a bench scraper to cut into three loaves, then transfer the loaves with a very thin, large spatula to parchment paper. You can use a pizza peel to move the parchment paper with loaves onto the preheated pizza stone. I then used the edges of the parchment to turn the loaves 180 degrees in the oven about half way through baking. 450°F with 2 seconds of steam. Bake for 20 minutes. Vent an additional 10 minutes then remove from oven and cool on wire racks. Your "slipper bread" looks great! I bet it tasted great with the dried cranberries. I'm so glad you enjoyed it. I left my flaxsees soaker overnight, so you can leave it even longer if that's handy. 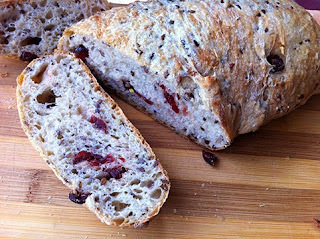 Beautiful loaf, love the red cranberry addition too. ...dried cranberries! And 9-grain flour blend. How brilliant. Ah, yes, I know we would enjoy this with dried cranberries as well. Anytime you can change so little and then see so many different ways to enjoy a recipe, you know it's a great one. Ciabatta ...means slipper. Okay. And, after examining the recipe (and other basic ciabatta recipes), I still see no reason why!! Maybe people had loaf-shaped slippers...? At least this looks pretty and tasty! Cathy, this bread is a keeper...many thanks for choosing it. Lien, wonder how long the flaxseed soaker could soak? Do you think that would give even more flavor? Elizabeth, the ice cubes were easy, finding the right pan hard. Didn't want to use cast iron skillet because I like the finish I've been able to create so far. Tanna, this really is a great one. Want to bake it with pecans and apricots next. Pink, Rich And Oh So Strawberry...What a Cake!